RECOMMENDED POST: How To Make EXO OVERDOSE Cupcakes! How to make this is 5 easy steps! Oh dear, what a busy week! A lot has been happening, including that I've moved into a new apartment, I'm now writing for Arirang Korea TV, and R.P.M performed at the AllTV Music Bank! 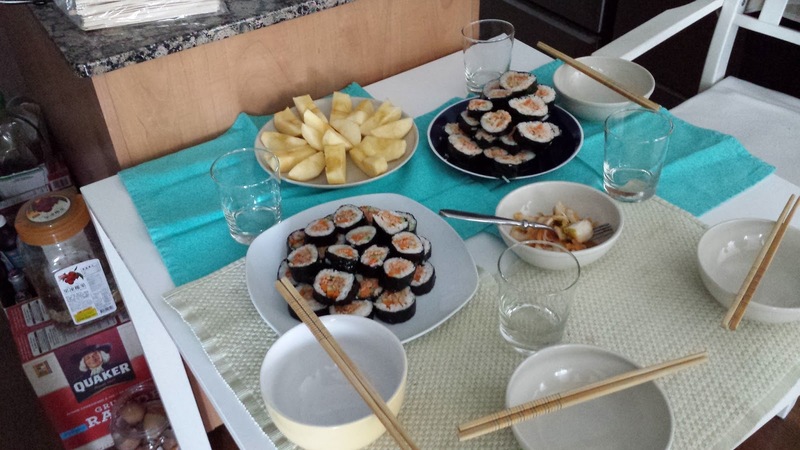 In the meantime, I'll share some pictures of when R.P.M got together and we made some homemade tuna gimbap. You may use vegetarian or other meats to fill in the dish (I am a pescy so tuna was just dandy!). The rice-and-seaweed combo has given it a nickname of "Korean sushi". Although similar in appearance, gimbap features a softer and moist seaweed texture as well as cooked meat. 1. Place a sheet of seaweed on the bamboo matt. With a spoon, spread some rice onto the seaweed from top edge, to a little more than half of the seaweed sheet (see photo). In the centre of your rice rectangle, spread a horizontal line of kimchi about 1.5 inch in thickness. On top of that, spread a thick application of tuna paste to cover the kimchi. 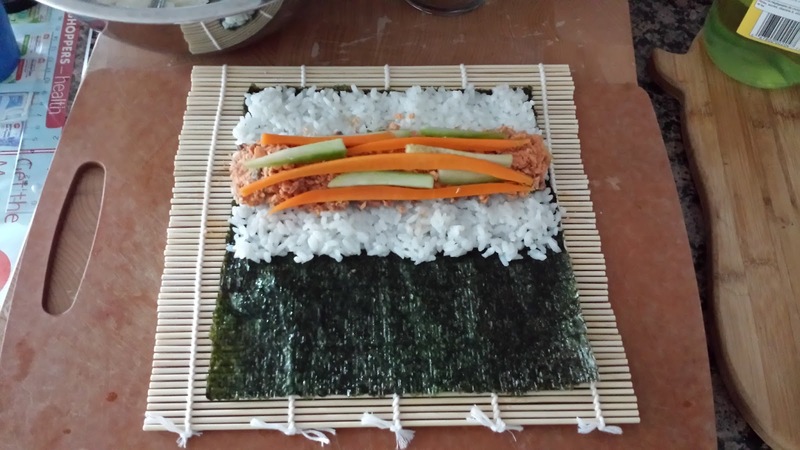 Finally, decorate your fishy mound with a few sticks of slivered cucumber and carrot. 3. 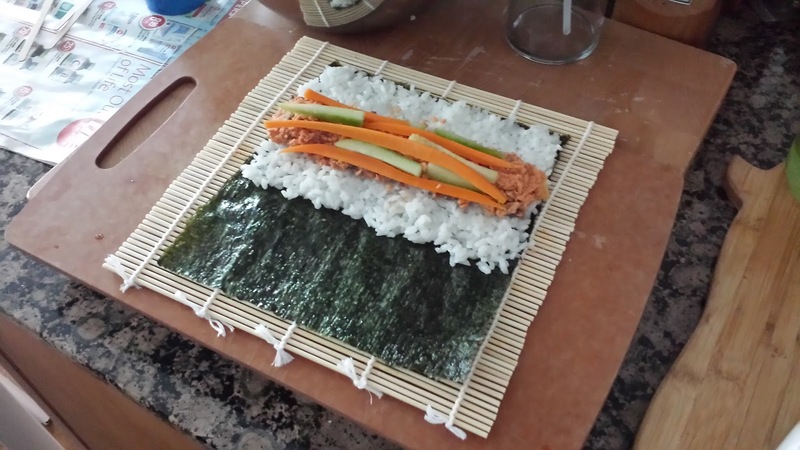 Now you're going to roll your gimbap! This is the tricky part, because it resulted in some very sad piles of goo. You should start rolling your bamboo mat from the top, where the rice touches the edge of the seaweed (see above pic), and as TIGHT AS POSSIBLE, so that your roll sticks together. Peel away the bamboo mat. Finally, use a few grains of rice to stick the seaweed together. 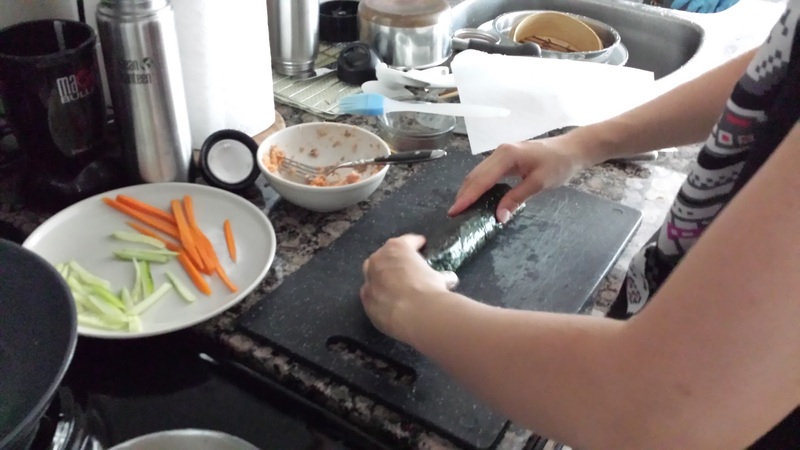 Continue to slice the gimbap into sections of about 1.5cm- 2cm each. The thicker the pieces, the better it will hold together! The key is to make gradual and careful cuts without squishing the round shape of the roll, otherwise you will end up with a rice pancake. Yikes! How the gimbap should look like after being sliced! 5. Arrange your gimbap pieces into a nice dish, serve and enjoy with more kimchi (why not?!) and fruit! 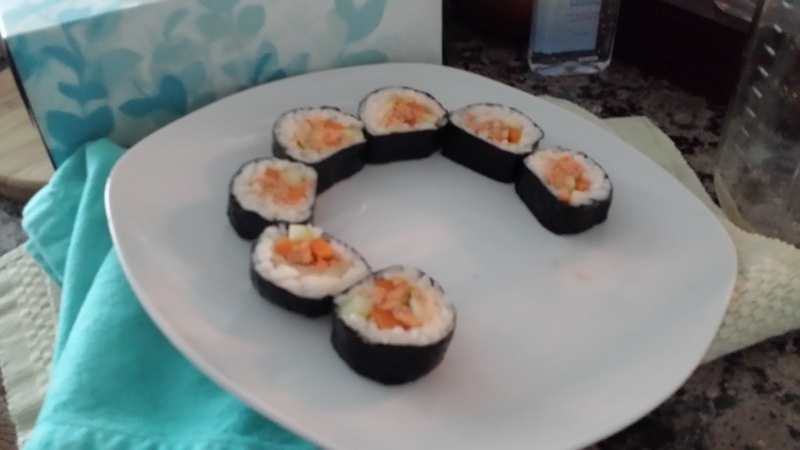 Thanks Jen for teaching me how to make Korean kimbap! They're certainly filling and definitely a good portion meal. I will be playing around with different fillings and mixtures, including a vegetarian option. What's your favourite Korean food? Comment below!